Monty Python’s Flying Circus aired from 1969 until 1974, but the conclusion of the series did not mark the end of the troupe’s creative output. Even before the final original episodes were recorded and broadcast, the six members began work on their first feature-length enterprise of new material. Rather than string together a series of silly skits, they conceived a full-length story line with references to the real and imagined worlds of the mythical King Arthur, the lives of medieval peasants, and the gloomy climate of 1970s Britain. Released in 1975, Monty Python and the Holy Grail was a modest success but has since been hailed as a modern classic. 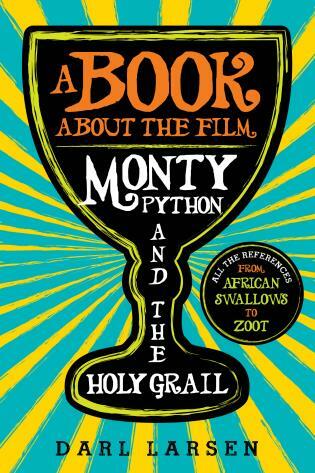 In A Book about the Film Monty Python and the Holy Grail:All the References from African Swallows to Zoot, Darl Larsen identifies and examines the cultural, historical, and topical allusions in the movie. In this entertaining resource, virtually every reference that appears in a scene—whether stated by a character, depicted in the mise-en-scène, or mentioned in the print companion—is identified and explained. Beyond the Arthurian legend, entries cover literary metaphors, symbols, names, peoples, and places—as well as the myriad social, cultural, and historical elements that populate the film. Darl Larsen is professor in both the Media Arts department and the Center for Animation at Brigham Young University, where he teaches film, animation, screenwriting and popular culture studies. He is the author of Monty Python, Shakespeare and English Renaissance Drama (2003) and Monty Python's Flying Circus: An Utterly Complete, Thoroughly Unillustrated, Absolutely Unauthorized Guide to Possibly All the References (2013). Monty Python scholars—yes, there are such animals—will love this close reading of the British comedy troupe’s 1975 film Monty Python and the Holy Grail. Larsen, author of two previous books about Python, provides a highly detailed analysis of the film’s inspirations and historical accuracy, as well as its reflections of contemporary British life. The character of Dennis, the peasant who engages King Arthur in a lively (if mostly one-sided) debate about dictatorships and anarcho-syndicalist communes, is an amalgam of British politician Tony Benn and union leader Arthur Scargill. The Rude Frenchman’s pronunciation of the word 'knights' ('k . . . niggits') is actually very close to the actual Old English pronunciation. A throwaway line about a 'large wooden badger' is a reference to the ludicrous Badgers Act of 1973. The famed 'Holy Hand Grenade of Antioch' is a reference to the early-1970s religious violence in Ireland and other places. There’s a three-and-a-half-page analysis of King Arthur’s four-word line 'King of all Britons,' and a lengthy discourse on the structure of the film’s title (which is a mere six words long, two of them being 'and the'). Larsen also traces many of the film’s most playful elements, its word games and non sequiturs, back to The Goon Show, a wildly popular radio comedy program in the 1960s, which was one of Python’s key comedic influences. Truly, this is a magnificent book, adding multiple layers to a Python fan’s enjoyment of a classic film. A Book About the Film: Monty Python and the Holy Grail [is] groundbreaking[!] [This] coconut-clacking British comedy troupe's 1975 feature is examined from every angle in this 578 page tome, a scene-by-scene deconstruction full of diligent notations and thoughtful analysis. When Larsen starts citing the giants that pop up in Sir Thomas Malory's Le Morte d'Arthur at the beginning of his chapter on The Knights Who Say Ni, well, you may want to say "Ni" right back at him. The groundbreaking, coconut-clacking British comedy troupe's 1975 feature is examined from every angle in this 578 page tome, a scene-by-scene deconstruction full of diligent notations and thoughtful analysis. When Larsen starts citing the giants the pop up in Sir Thomas Malory's Le Mort d'Arthur at the beginning of his chapter on The Knights Who Say Ni, well, you may want to say 'Ni' right back at him. If you're a fan of the British comedy troupe Monty Python, and especially if you love their 1975 film Monty Python and the Holy Grail, then you absolutely must get your hands on A Book about the FIlm Monty Python and the Holy Grail, by Darl Larsen. 'Scholarly' is the best word to describe the book; it's a virtually line-by-line annotation of the film. . . . The book is both a glorious celebration of Python's best movie and a thoughtful frequently surprising look at all its various connotations and inspirations. If you're a Monty Python fan of any generation, you've most likely watched Monty Python and the Holy Grail about a dozen times or so. But as anyone obsessed with the film will tell you, you just can't always catch all the jokes. It has nothing to do with the intelligence or history or even that it's British–the film simply has too much material in it for everyone to get each reference. Well, now you can! This book has everything, all the way down to the most meaningless phrases, explained in detail as to why they're there in the first place and why you should find it funny. Examples would be: why King Arthur and his knights avert their eyes from 'The Lord,' why the monks bash their heads with wooden slabs, why is it called the Castle Anthrax, why Lancelot hacks and slashes his way through the wedding, and all that useless information about swallows. Plus, the book goes scene by scene, in order, so you can follow along for however many hours it takes you to read and watch it. [A Book about the Film Monty Python and the Holy Grail] is absurdly packed with lowbrow humor and farce. It’s also eminently quotable. . . . Some little part of me is thrilled that high school and college students in a couple hundred years will have to watch Monty Python and the Holy Grail and reference your annotated guide. In many ways, a book about Holy Grail is a natural scholarly segue. With this latest work, Larsen sets up the film as a text worthy of study due to the multiple worlds that it primarily converses with: the Middle Ages, Arthurian literature, and contemporary British culture at the time of the film’s production. He has created a Python wiki full of referents that traverse these worlds with careful and methodical extrapolations that are deeply anchored in academic scholarship on the medieval literature, Arthur, Arthuriana, film studies, and more. Few components of the film are left unexamined whether it is a line of dialogue, titles, end credits, scenic locations, props, or camera directions. Larsen unpacks these artifacts with such a refined critical edge that the reader is left impressed even by the occasional minutiae that such an effort produces in the book. . . .[T]he annotations and connectives in the book question whether Holy Grail is a medieval film or a film made medievally? Larsen has produced a tremendous resource that vigorously pinpoints the reflective nature of the movie. It converses with other Python productions, but more importantly, it provides a rich lens to examine historical, cultural, and political intersections and divergences. . . .[F]aculty of courses in literature or film studies could easily utilize the resources contained in the book. Because the annotations often link to political situations and figures of the 1970s, instructors in history or political science might also find the book an insightful supplementary tool. As an academic tool, the book could easily appeal to instructors and students across multiple disciplines. 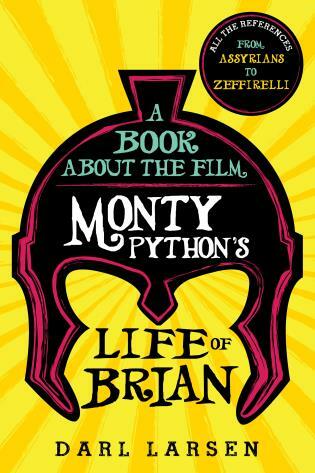 This book is an in-depth analysis of the 1975 film Monty Python and the Holy Grail, which has become a cult film in the USA, and has more recently been revived as the musical Spamalot. . . .This book will be a great help to those who want to understand appreciate this quite remarkable film. The Monty Python team went on to make two more films. Beyond this, individual members went on to make other films; some comic history, some political and social comment and some more mainstream drama. The start of all this is here. . . .There is a good index and a very full bibliography. An appendix explains the drawings in the 'book'. This book employs the film as a window to both reveal and examine “Arthurian” life and literature, the historical Middle Ages, and a Great Britain of labor unrest, power shortages, and the common man. Introducing the reader to dozens of medievalist histories and authors and connecting the film concretely to the “modern” British Empire, A Book about the Film Monty Python and the Holy Grail will appeal to fans of the troupe as well as medieval scholars and academics who can laugh at themselves and their work.